Behdad Salimi Kordasiabi is an established name in world of weightlifting. 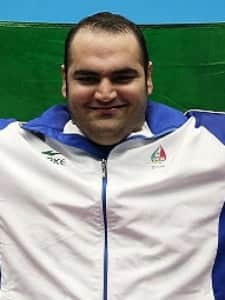 A gold medalist, Salimi has continued to bring glory to his homeland Iran by making a mark in the major sporting competitions around the world. Born in 1989, this young weightlifter in the +105 kg category bagged his first gold medal 2010 World Weightlifting Championships. The streak of winning the gold continued in 2010 Asian Games, followed by 2011 World Weightlifting Championship in France. The greatest achievement in Salimi's career was recorded in 2012, when he became an Olympic gold medalist. Subsequently, he developed soar ties with the sporting authorities of Iran, and faced disciplinary action for revolting against the then coach Kourosh Bagheri who allegedly used foul language against the athletes. However, for 2016 Rio Olympics, he was given a fair chance to qualify. Salimi seized the opportunity at once and made it to the grand stage again.